Warning: What I am about to divulge is not for everyone. Well, that’s not entirely true, so let me take a deeper breath and rephrase that. 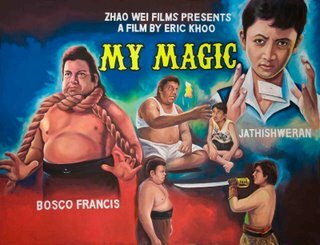 I am about to divulge that Eric Khoo’s latest effort, ‘My Magic’, is not for everyone. It is not for the younglings (even though one of the main character is a young little Indian fella), it is not for the pregnant or the elderly, and it is most certainly not for the ones who hang out on the beach until 4am talking about life, love, the universe, and explaining to a Swiss guy about our oil price policies (“YOU GUYS HAVE YOUR OWN OIL AND YOU JACKED IT UP 40%?!! ).Far more importantly, should you not fall into the categories outlined above, you should still be aware that this film is not suitable for a morning screening. For, despite its name, it is not really something. So I woke up, washed my face, ran to the theatre (bumping into the same Swiss guy. Not that surprisingly, actually), and not regretting the decision. Well, not that much. "Have you seen my shirt?" 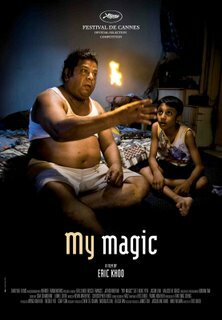 Bosco Francis, a real-life, full-size (and I do mean full-size, though this comes in handy later) Indian magician who struggles with the trials and tribulations of everyday life, along with his son Rajr (Jathishweran). If anything, Rajr has it worse off than the both of them. He seems like the good kid, diligent at school, turning in early at night, doing other people’s homework for money and pining for his own mother (it seems to be a South East Asian indie film disease, to have an absent mother. Where have all the women gone?!) and generally fend for himself a fair amount. Not that he has much of a choice: his father works at a bar to make ends meet. Unfortunately, those ends consists the end of his work shift and the end of the bottle going up as he downs another bottle of alcohol. In fact, this is where the film starts: him drinking. He guzzles them down like water, repeatedly asking the waiter for another one. Returning home, though, his son, with anger and disappointment proving to be a potent mix, rails at his father for his lack of responsibility. In many ways, their roles in the film is quite reversed; Rajr is very much the ‘father’ in this father-son relationship, constantly admonishign him. He has his own problems to deal with at the same time, with several kids from school taking advantage of him. The CGI work was instantaneous. 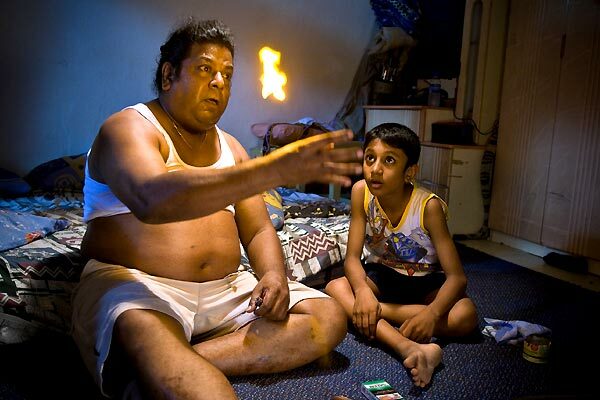 e thing that he is indeed very good at: magic. Actually, it says ‘magic’ here on the box, but one may well describe it as ‘the insane ability to withstand a crazy amount of pain’. There is some quality magic in the film, though, and it is during these scenes that truly enraptures the audience. You could almost feel everyone in the cinema leaning slightly forward and yet squinting their eyes at the same time, not willing to see a man push sharp objects through different parts of the body before KFC even opened (that may well have been a good thing, for it would have settled rather uneasily in the stomach). I have to admit, at times it felt as if I was watching a circus act. Thankfully, all is not without its due reward, as Bosco’s boss (Jason Lim) pays him to bring in the crowd into the bar. As an aside, it is evident that Mr Khoo is not really keen on doing his part to dismantle social stereotypes/regional realities (the alcoholic Indian, the money-loving Chinese. I half expect to see a Malay guy not really doing anything). “If it weren’t for me, you would even be making any money” was one of the pun-intended money lines. I can’t go on further without discussing the absent female figure, either. In sharp contrast to ‘Puinggok Rindukan Bulan’ (a Malaysian film I later saw that also deals with the same issues), Eric Khoo consistently and actively makes it obvious. Bosco, for example, makes phone calls to his wife, telling her to come home for the sake of Rajr. Show, and tell. These are the moments that truly crystalises the hopelessness of their situation. Flitting finely between ‘sympathy’ and ‘pity’, I definitely couldn’t help but feel something for these characters. On a whole, it is not a particularly extraordinary film. Did it live up to its hype, as a ‘Cannes’ film? Not entirely, certainly not as much as ‘Parking’. It is, after all, a very small film, with few characters, even fewer sets, a small budget, and all within a running time of less than 80 minutes. Nowadays, that feels very short. In some ways, it was not a particularly good thing; I had wanted the journey to go on a little bit further, and that the nice moments I was talking about could be fleshed out a little bit more. I wish that some of the issues weren’t so easily solved, and that perhaps more than a little complication would do it well. Nevertheless, in terms of reaching that which was aimed for, Eric Khoo came, saw, conquered, and went back home. Oh, and it was a nice ending as well. But to be honest, had it gone on any longer…I probably couldn’t stomach another scene of him piercing himself. Fikri is glad that the price of oil is lower now in Malaysia.